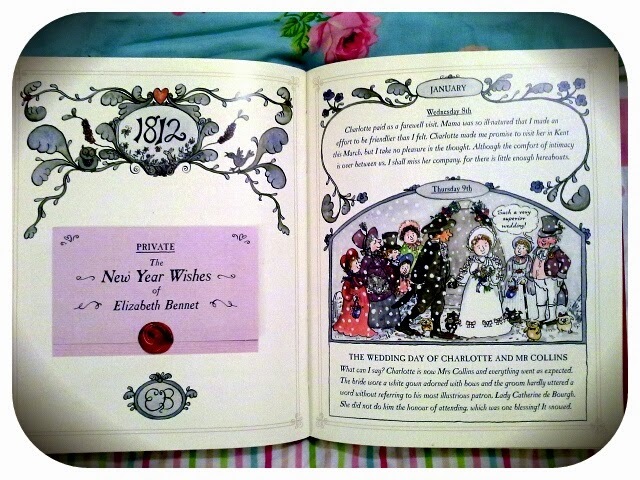 This is a sweet little book, full of witty references to Jane Austen's 'Pride and Prejudice'. 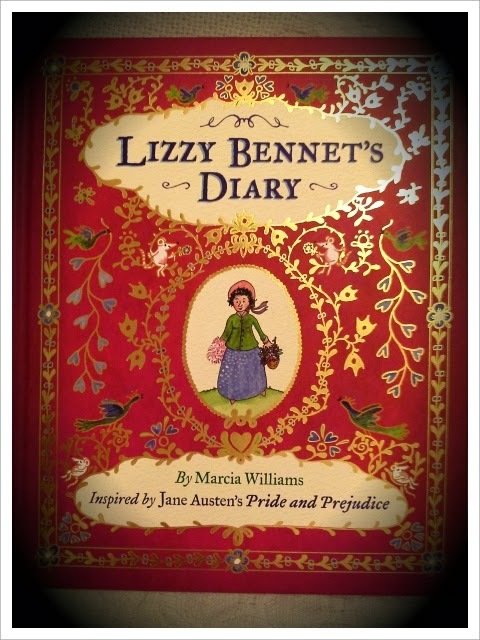 As with every proper diary, it is crammed full of detailed observations and private comments about those around her. As such, the book reads like a summary of Austen's novel, with additions relating to every day life - such as favourite fabrics and ribbons; mementos and souvenirs. This works particularly well, because we experience so much of the novel from Elizabeth's point of view. mention it, she is already twenty-seven years old - nearly ten years my senior!' Of course, the real Elizabeth Bennet would never say such a thing, and certainly would not refer to her dearest friend as an 'old maid' as Williams's Lizzy does. I suppose that is the draw-back of condensing a long novel into such a concise format: much character development is omitted. The brevity of the text is a little unsettling and at times the book is overly-simplistic, with Lizzy occasionally sounding too much like Lydia and Kitty - obsessing about ribbons and balls - than our beloved heroine. There are over twenty letters in Austen's novel, and some of them feature here. They are handwritten in beautiful fold out pages, and, as in the original text, they allow us to hear directly from the other characters in the novel, such as Mr Collins, Mrs Gardiner and Fitzwiliam Darcy. Some letters are copied verbatim from the mother text, while others are fabricated entirely from Williams's imagination. 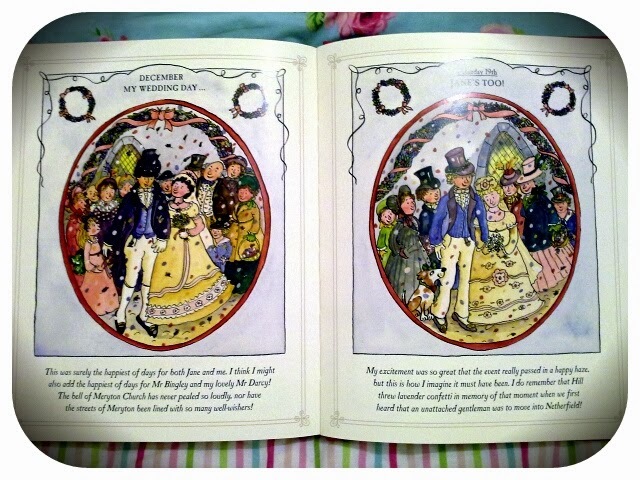 We catch glimpses of Mr and Mrs Darcy, at home, at Christmas, preparing for dinner with Georgiana and the Gardiners. 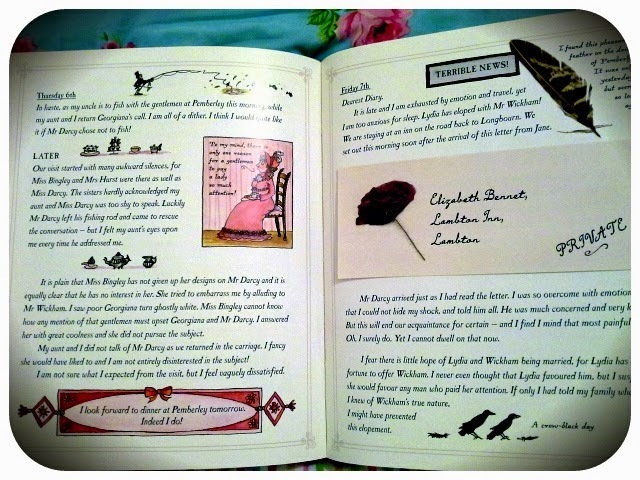 Such delicious flights of fancy are what make this book worth having. illustrator first and a writer second. They are full of detail and will draw you to the book again and again. They may lead you to believe that the book is more suitable for a younger audience, but I think that readers who are very familiar with Austen's novel, probably older book-lovers, will get a great kick out of the many in-jokes and references. 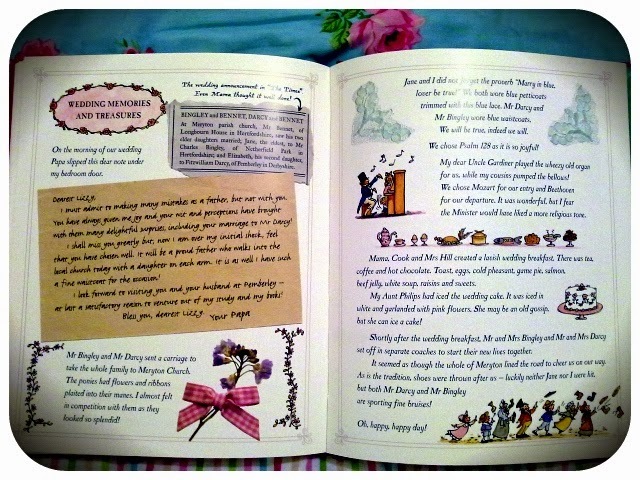 That said, there is much to enjoy in this book, for readers of every age. Well, how could it fail? It is inspired by the great Austen herself!